This page is dedicated to how to grow the perennial varieties of phlox. Information on how to grow annual phlox here. The timing of blooming of Perennial phlox's depends on the species and ranges from spring through to the early months of autumn. Phlox may be upright or prostrate and carry masses of flowers that may be star shaped. Phlox flowers in many colours depending on the species; these include white, blue, pink, and purple. There size makes them very versatile and they may be used in many parts of the garden including rock gardens, borders, and edging, wildflower gardens or anywhere really. Common species of phlox are Moss pink, David, and Garden phlox. Starfire Phlox by Daryl_mitchel; creative commons. Life Cycle: Hardy perennial. (Go here for information on annual phlox). Growing Region: Perennial zones 3 to 9. Sow Outside: Perennials: Cover seed. Sow in flats in the autumn. Sink flats in a shady area. Provide a glass/plastic covering. Transplant seedlings in spring with a spacing of between 6 and 24 inches (15 to 60cm) depending on species size. Requirements: Full sunlight or light shade. Good drainage. Soil pH 6.5 to 7. Rich soil. Organic soil. Moist soil. Regular watering. Summer feed. Pinch tips. Deadhead. Perennials should be cut back to the ground after flowering has completed. Thin perennials in spring. Propagate perennials by dividing or cuttings in the spring. When growing perennial phlox from seeds it is best to do so outdoors. Sow the seeds into flats, and lightly cover the seeds in the autumn. The flats should then be sunk into the ground in a fully shaded part of the garden and covered with glass. Be sure to check on them regularly to make sure the soil remains moist. It should take about 4 to 7 weeks to germinate. The seedlings can then be transplanted the following spring (or in autumn if the perennial phlox seeds are slow to germinate). They should be spaced at about 15 cm (small species) to 60 cm (large varieties) apart; they require good circulation of air to prevent mold. 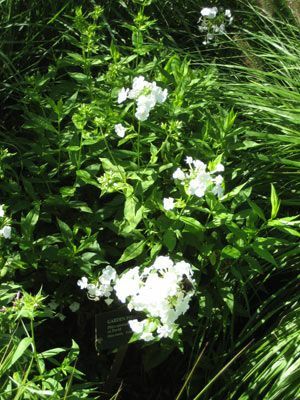 Phlox are able to grow in both partially shaded and sunny areas and ideally should have a moist soil that is rich in organic matter and of pH 6.5 to 7.5. 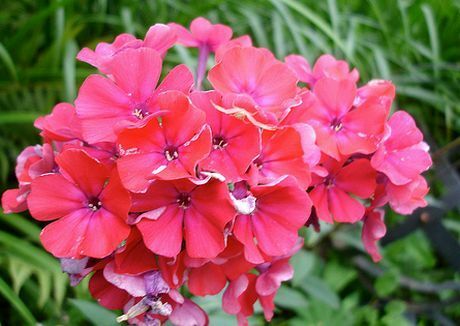 It is important to keep perennial phlox plants moist so water regularly, however try to ensure that you water the soil and not the leaves as they are susceptible to mold. Once blooming occurs deadhead dying flowers to prolong the season. Once the season is over cut back hard to tidy the plant. When spring arrives cut back hard to thin the phlox, just leave 4 stalks. If you require more plants they can be propagated by division (autumn) or take cuttings (start of spring).